In 2012, the Nats had no less than 10 arbitration candidates once the dust settled on the Super-2 cutoff. The team cut ties with three of the players (Jesus Flores, Tom Gorzelanny and John Lannan) and then subsequently struggled in areas where Gorzelanny (left handed matchups) and Lannan (5th starter) may very well have helped during hte 2013 season. We predicted these three non-tenders and mostly agreed with the thought process behind each decision at the time. This is a complete “hindsight is 20-20” analysis, but it does go to show that perhaps instead of dumping $11M/year onto a mediocre closer they could have fortified their ranks and kept all three players (who together wouldn’t have totaled the $11M Rafael Soriano got) and perhaps wouldn’t have struggled in these areas for so long. Or perhaps not. I digress. For 2013, the Nats have 8 Arbitration-eligible players. They had a few other candidates before some demotions (Danny Espinosa, Ryan Perry) and releases (Roger Bernadina and Henry Rodriguez) cleared out potential non-tender/additional arbitration candidates early. Unlike last year there’s really not much argument about nearly any of our arbitration-eligible players (even mlbtraderumors does not list any Nats in its non-tender candidate list). Lets take a look at the 8 guys, their 2013 salaries, their 2014 estimates, and discuss. The salary projections are from Matt Swartz‘s mlbtraderumors model, and I’ll discuss if I think they’re slightly over- or under-representative. As with all salary discussions, all information comes from Baseball Prospectus’ Cots page. Frankly, the only possible non-tender candidate I see here is Ross Ohlendorf. He signed a minor league free agency deal with Washington whose terms were never released, so one can only assume it was for the major league minimum or near it. He went through arbitration once already, earning more than $2M/year from Pittsburgh in 2011 before bottoming out as a starter. He’s reinvented himself this year though and merits a tender. Paying anything less than $2M/year for what we got from Ohlendorf would be a bargain. If the Nats got him for Swartz’s estimate of $1.3M that’d be fantastic. (* Stammen signed a 2 yr/2.25M deal paying him 875k and $1.375M his first two arb years. After non tenders Lannan signed a 1yr/$2.5M deal with Philadelphia, Gorzelanny signed a 2yr/$5.7M deal that pays him $2.6M and $2.8M and which gave him a $300k signing bonus. Flores signed a minor league deal). I’m not sure I’d call Swartz’s model the self-titled “very accurate” based on these numbers. He was significantly wrong on the three biggest cases the Nats faced last year but proved be much more accurate on the lesser players. It sounds to me like his system does a great job of predicting arbitration figures for bit players but struggles with significant players. I also get the feeling that the Nationals are less willing to argue with their players than other teams, after a series of brusing and self-defeating fights over a few hundred thousand dollars under the previous regime (relative pennies, all things considered). 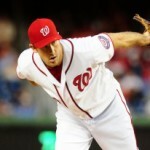 Jordan Zimmermann: 2013 Salary was $5.3M. Swartz guesses he’ll get $10.5M while I think he’ll get more. If Zimmermann hit the open market right now you have to think he’s at least a $15M/year guy, and I think the team will have to pay him as such after his 2013 season. The Nats face an interesting decision with Zimmermann; they clearly waited one season too long to lock him down and he now may cost double what it cost the team to secure Gio Gonzalez‘s services. Tyler Clippard: 2013 salary $4.0M. Swartz guesses he’ll get $6.2M. Clippard represents a different arbitration case; by virtue of the fact that Clippard went from being the 2012 closer to being the 2013 setup guy, he’ll have a harder time arguing for additional money despite his excellent season. Why? Because arbitration is driven by the same old-school stats (Wins, Saves, ERA, RBI) that drive sabrematricians crazy, and unfortunately Clippard didn’t get them in 2013. So even though I think he’s a $8M/year closer for a team that gives him that opportunity, he won’t get that value in arbitration. I’ll be surprised if he gets near to Swartz’s estimate of $6.2M. Honestly the team should look to buy him out of his last two arbitration seasons and look to move him to a team in need of a closer. Stephen Strasburg; 2013 Salary $3.9M. Swartz guesses he’ll get $3.9M again? Clearly something is wrong with his system. No matter what you think about Strasburg’s 2013 season … by nearly any measure available he’s one of the 10 best pitchers in the game. If he hit the open market right now I’d guess he’d command at least $20m/year, but for simplicity’s sake I’m putting his FA value at a conservative $15M, which would equate with a $6M valuation for his first arbitration season. Do the Nats just buy him out of his arbitration figures, much as the Giants did with Tim Lincecum? Ian Desmond: 2013 salary $3.8M. Swartz guess: $6.9M. Again, I feel like Swartz is undervaluing a significant player here. Desmond has now established himself as one of the best shortstops in the game. If you want a comp, look no further than Elvis Andrus‘s $15M/year contract. I think Desmond is absolutely worth a 6/$90M deal or higher right now, and I think we’ll see it in his arbitration case. Drew Storen: 2013 salary $2.5M. Swartz estimate: $3.6M. Here I think Swartz is right on; because Storen’s not getting saves right now, and because of his crummy 2013, I’ve got his FA value pegged at a mid-range closer cost of $6M/year. Which puts him right in line for a $3.6M payday in his second arbitration year. As with Clippard, I think Storen’s value is limited as long as he doesn’t get saves, and the team should look to move him before he gets too expensive. Ross Detwiler: 2013 salary $2.3M. Swartz Estimate $2.8M. Frankly Swartz may be over-estimating on Detwiler, based on his 2013 season. At this point in Detwiler’s career its hard to say he’s any more valuable on the FA market than John Lannan was last year (getting a 1yr $2.5M deal). Which means that any arbitration award above $2.5M may mean Detwiler enters non-tender territory if he struggles in 2014. Nonetheless, I think he’ll end up getting just a modest raise and an organizational ultimatum for 2014. Wilson Ramos: 2013 salary $501k. Swartz Estimate: $2.1M. Here, despite my thinking that Ramos is eventually going to be more valuable than Swartz’s estimate indicat es, I believe that his number will be about right. Ramos needs to stay on the field consistently to realize his full FA value, and right now that just hasn’t happened. Ross Ohlendorf: 2013 salary unknown. Swartz Estimate: $1.3M. This guess is as good as any; at best Ohlendorf is a $2.5M player on the FA market and even that might be a stretch. A right-handed long-relief guy isn’t going to command a ton of money. Total payroll hit: $37.3M if all of Swartz’s estimates come true exactly. $44.7M if all of my estimates above come true. Honestly I think my calculated estimates are slightly high in a couple of cases, so I think the arbitration bill will come in at around $42.5M. Which, by the way, would put 2014’s payroll at around $122M before signing a single free agent. So think about that and think about what the Nats “real” payroll budget is before thinking that they’ve got some significant signing in their back pocket. Subscribe to comments with RSS or TrackBack to 'Nats 2013 Arbitration cases; (Non-Tender deadline 2013) candidates and salary analysis'. I agree with you on Stras number, but Desi’s seems high. Maybe because he has only had two years of superlative performance? I agree that waiting to extend Jordan probably means that they don’t extend him. We’ll see what Garza gets, but I think Jordan gets $10m+ more than Garza, when all is said and done. And I just don’t think the Nats do that, with Ian being a bigger priority and Stras looming out there. The bigger question is, does Rizzo trade him now, since prevailing wisdom appears to be to get max value of a guy while you have two years left. I agree with your numbers for Det, but disagree with your Lannan comparison. Ross hasa floor of a very effective LH reliever, and those guys get paid. Lannan doesn’t have the stuff for that role. I’ve talked about Desmond’s value a couple times here; once before the 2013 season right after Andrus signed his 8yr/$120M deal and then again in October in reaction to a Ladson mailbox. Yes, Desmond only has two years of superlative performance … but look at Andrus’ performance years that earned him 9 figures. .. comparable defense to Desmond’s but significantly weaker offense. Desmond is now a very, very rare commodity; a plus defensive shortstop who also hits 20+ homers and bats in the middle of the order. What’s the list of those guys in this league? In the last two seasons: Tulowitzki, Hardy, Desmond, Rollins, Hanley Ramirez. Tulowitzki plays at altitude, Hardy plays in the offensive-minded Baltimore. Rollins too, and he’s likely not hitting 23 anytime again. I just think Desmond is well on his way to a 9-figure deal. Can’t trade Zimmermann now; not with the “win-now” construction and not with 3 of your most expensive players (LaRoche, Soriano, Span) FAs at the end of 2014. If the Nats falter again this coming season, you trade everybody in a contract year, you move Zimmermann for prospects, you clear things out to make the next run. Has Detwiler proven he can be a loogy? Has he proven he can even be a reliever? Great splits career-wise as a reliever (1.11 era) but only 32 innings worth. And frankly, most of those innings were in mop-up duty when he entered into zero leverage situations when the other team was just playing out the string. If Lannan is a lesser pitcher but who eats innings (zero injury history until this year, and even this year’s “injuries” seemed like the kind of soft-tissue BS injury that teams use to stash guys instead of releasing them) and Detwiler is a better pitcher who can’t be counted on … which would you rather have? I think it’s best first off to welcome you back. I am not disagreeing on Desi’s value or the contract that it would require to extend him, just that it may not show up in this year’s arb number, because they are heavily stat oriented. Andrus didn’t get that value in arbitration, he got it in the contract, and I think Desi will follow similarly, if he even gets that far. My guess is that they agree on a number beforehand, or reach an extension. As for Det, I think that he is more than a loogy in the pen. I think that he can face righties or lefties, and go multiple innings. I compare him to Sean Marshall, who is very similar in stuff and injury history. That guy has had value both in trade and contract. I would take him in a heartbeat over Lannan, and I think most teams would too. I don’t think that I would go into a season counting on him to be a starter, though, because of your comments. I don’t mind that as Plan A, but there needs to be a quality B and C ready to go. Desi; fair enough. But what do you think an arbitrator would do if the team comes in at Swartz’ estimate (6.9M) and Desmond demands $9M? Desmond is pointing at back to back 20 homer seasons, back to back silver sluggers, and an all-star appearance (and a snub this year?). I dunno. Maybe 9M is too high. Detwiler: i’m soured on him, officially. His 2012 spurred me into his defense, and his 2013 reminded me why I was sour on him before. A starter is always going to be more valuable than a reliever. I guess what I was getting at is this: which is more valuable (which would be paid more on the open market): a near replacement level innings-eating 5th starter or a one-out lefty? I still think its the starter. The starter goes 6 innings, 15-20 outs. The loogy goes 1-2 batters? Maybe the better way to look at it is this: what was the BEST loogy deal that was signed last off-season? Looking at mlbtradrumors 2013 FA tracker, it was Jeremy Affeldt 3yrs/$18M from the Giants. A deal that was widely panned. Burnett got 2/$8M. Gorzelanny 2/$5.7M, Mike Gonzalez 1/$2.25M. Oliver 1/$3m, Choat 3/$7.5m. I dunno. Maybe i just think the price of loogies is way too high. So perhaps Detwiler even as a bullpen guy has a FA value more than i’m giving him credit for. Welcome back? I didn’t realize i was gone that long. Yeah Nov 20th, wow. I’ve been here, just didn’t have much to say I guess Actually I do have a ton to say but not enough time to really delve into what I want to do. On Detwiler, I can see why you have soured on him if you think that he will still be a legit #4 starter. I think that ship has sailed. Best that I can tell, he has only had two seasons in his entire career (minors and majors) where he exceeded 100 IPs. And he basically throws one pitch, making it hard to get through a line up three times. But I do think that he is more than a LOOGY, so I am not sure those deals are great comps (even though they still make him look like a bargain at a $3m salary). He has some platoon splits, but they aren’t that pronounced. In the pen, he can probably average 95 on his FB. For a win now team, having him be able to come in the 4th inning when a starter leaves early, and get them to the 7th is a powerful weapon in the pen. I wouldn’t be surprised if he could throw 70 IPs at a 3.00 FIP in the pen, which would be worth ~ 1.5 WAR, or about $10m at today’s rates. I think if you look at Detwiler that way, he is valuable. But it means that they have to go sign a starter. I used to think he would be a great #4 starter. I based a lot of that opinion on his stellar ERA+ numbers in 2011 and 2012. But i’m more and more coming to distrust that number. In 2012 Detwiler had a 118 ERA+, which literally means that the league average ERA (park adjusted) was 18% lower than his ERA on the season. Pretty good, right? That was good for 12th in the NL. But in SIERA for 2012 he was 76th of 88 qualified starters. And the other advanced pitching metrics (fip, xfip, tera) all have him as just a middle of the road starter. And that was in his best year. I wonder; does Detwiler even have a role in the modern pitching staff anymore? If you’re not a starter and you’re a lefty … aren’t you by default a loogy? How many left handed closers are there? One or Two (based on usage in 2013 there were primarily two: Aroldis Chapman and Rex Brothers). Don’t teams just pay minimum wages for some veteran hanger-on to be the long-man/mop up guy? Why pay a ton of money for that guy? I just don’t think there’s value in paying for a long-man. Look at Zach Duke’s usage while he was here; he was here for 2 months and had 5 outings where it qualified as a long relief or spot start. (of course, maybe the joke’s on us; he went to Cincinnati, was used like a more normal reliever and gave up just one run the entire month of September). I think you just get a rubber armed veteran league minimum hanger-on (like Ross Ohlendorf) for that role. Generally speaking, I think they lefty/righty roles get overstated. Platoon splits and match ups are worth something, just not everything. Take the Phillies: I’d like to see a LHP face Howard in a critical spot, but against Utley, I’d rather have the best pitcher I have. So I think Detwiler can throw quality innings, and I’d be fine having him face righties. He has essentially posted league average FIP throughout his career as a SP, and those numbers should improve in the pen. He has a funky delivery, comes at you from first base, and shows you elbows and knees until he releases the ball. As a reliever, it is coming at you at 95 with pretty good sink, so he should get a decent amount of grounders. And he has some, not great, ability to strike guys out. For $3m on a 1 year deal, what is not to like about that? Switching gears, doesn’t it seem like Brett Anderson is destined to be Rizzo’s next acquisition? Oakland and Beane, Arizona connection, just seems like a done deal. It is going to drive you nuts, because he is Ross Detwiler II. Also, I am getting kind of antsy for Rizzo to start adding some bench pieces. I was hoping for Dioner Navarro, who went on a very reasonable 2/$8m deal to TOR. He has to do something soon: I can’t imagine going I to 2014 with the Onion, Lombo and TMo again. That would be brutal. Fister for Krol, Lombo and Robbie Ray, in case you haven’t seen it. I must be missing something, seems like a steal. What a pickup by Rizzo. This team went from having no pitching depth this time last year to having 4 really good starters locked in for at least 2 years and having the luxury of picking from Detwiler, Jordan or Roark for the 5th spot and still having Karns at AAA and Cole at AA. Looks like some more (cheaper) LOOGY options are available now with Jose Mijares, Tony Sipp and Wesley Wright all becoming free agents in the last week. I don’t see Rizzo spending much money in that area as proven last offseason but none of those guys seem like they would cost more than $1.5mm for a year and have all had varying degrees of success in the bigs. I think he will get someone but it won’t be from the JP Howell/Scott Downs tier looking for multiple years. Wally I guess that trade backs up your statement about Rizzo not sticking with a bench of the onion, Lombo and t-mo. He did a nice job of opening up a 40 man spot with the trade. Hypothetical scenario but with the DBacks non-tendering Daniel Hudson I wonder if he could be a fit like Wang was a few years back. Pay him to rehab and use him once healthy. He is from Lynchburg, VA so maybe rehabbing near his hometown would be appealing. Going back to our original thread, I’d love Det in the pen but I think that this makes it more likely that they try him in the rotation again (to get another lefty in there). If that happens, it seems like he will have to spend on a Howell type. 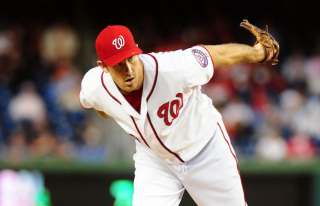 I’ll post a new post on the Fister deal, but yeah at first glance it looks like a complete steal for Washington.